It has a nice personality! 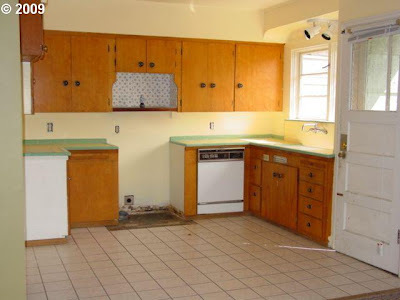 The nicest thing I could call the kitchen is "comically grimy." 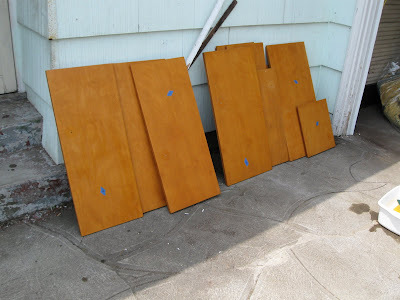 The cabinets, while still in good shape, likely hadn't been scrubbed in 20 years. There's no range hood, so I imagine any smoke just sort of sat in the kitchen. The cabinet doors were filthy and the hardware was from the 70's. And it was very ugly. I decided to remove all the doors and drawers, remove their hardware, and to give them a good scrub in TSP. I numbered the doors so I'd know where they'd go later. This was another Good Idea. Some of the hardware didn't want to come off, it was so caked with grime. 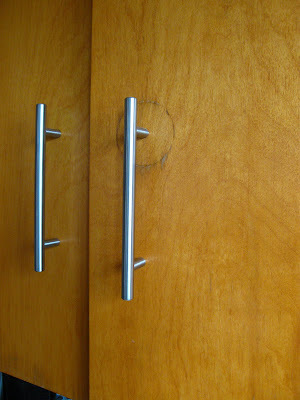 After scrubbing and rinsing and drying the doors, I did the same inside the cabinets, removing the old contact paper. Man, do I have feelings about contact paper. I removed 70 years of contact paper from the cabinets, layer upon layer of it. The bottom layer took me about two days to remove and I had to blast it with a hair dryer first to warm up the adhesive, then carefully peel it off in small strips. 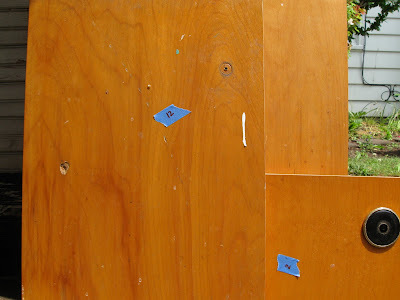 I swear that I am still finding bits of the old paper stuck to things in the house. I've decided that contact paper with adhesive is the devil, in fact. I decided it's not allowed in the house . . . well, except in those six drawers . . . but that's it! Someday, down the line, I'd like to have the doors refinished. I think the burl of the wood is gorgeous and these cabinets are STURDY. 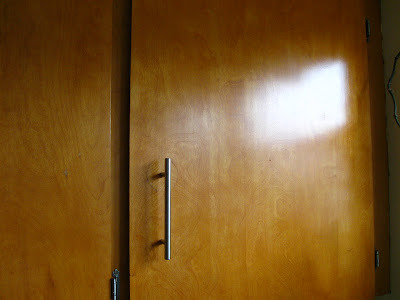 Someday I'll have a professional hang the doors too, because, man, is that ever hard to do by yourself. All of my doors are crooked or they overlap a bit, or they aren't level . . . I never knew that would be such a challenge.